With awards season well underway, City Journalism alumni have received nominations for a number of prestigious industry awards. City alumni have been shortlisted in ceremonies that include the Press Gazette British Journalism awards and the Foreign Press Association’s London Media Awards. Alongside those shortlisted, Siraj Datoo (Newspaper Journalism, 2014) has picked up an Asian Media Award and Gary Younge (Newspaper Journalism 1993) has received the 2015 David Nyhan Prize for Political Journalism. The various awards ceremonies celebrate excellence in journalism. City’s presence among the winners and shortlists demonstrates the strength of the University’s journalism alumni. The Press Gazette set up their awards scheme following the Leveson inquiry to promote journalism that is “both interesting to the public and in the public interest.” The Press Gazette Awards reception will be held on Tuesday 1st December when the winners will be announced. The quality of work submitted in these awards has increased every year. In a media world where anyone with a blog can call themselves a journalist, the big news organisations are clearly investing heavily in serious journalism to help distinguish themselves from the online chatter and noise. Nabeelah Jaffer (Interactive Journalism, 2013) has also been shortlisted for an award. The Foreign Press Association Media Awards, honour the best of British and international journalism. Nabeelah, now a columnist at G2, The Guardian has been named in the Feature Story of the Year: Print and Web category. The winners will be announced on Tuesday 24th November at an awards dinner hosted by Sandi Toksvig. Alongside the nominations, a number of alumni have been named the winners of prestigious industry awards. The Asian Media Awards recognise journalists, bloggers, TV presenters and PR experts who have excelled in Asian and mainstream media. Siraj Datoo, who graduated from City in 2014 is now a political reporter for Buzzfeed. He collected the prize for Outstanding Young Journalist in recognition of various exclusive reports he has published on topics ranging from elections and the Scottish Referendum to ISIS fighters’ use of social media. The David Nyhan Prize for Political Journalism is presented annually by the Shorenstein Center in honour of the late David Nyhan, a former columnist and reporter at the Boston Globe. 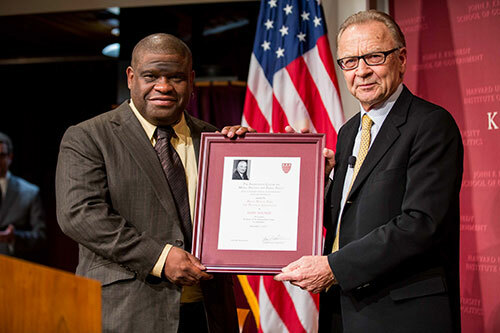 The award was given to City alumnus Gary Younge at the Theodore H. White Lecture on Press and Politics in recognition of his career in journalism. Amber Rolt (Magazine Journalism, 2014) has picked up an International Building Press Journalism Award. Amber was named New Journalist of the Year for her work as the Editor of the Estates Gazette. It’s great to see so many City Journalism alumni receiving prestigious awards and nominations this year. It is clear from the articles they have been nominated for that our alumni are tackling major issues and are making a significant impact. It is a privilege to have so many well-respected journalists among our alumni. Shortlisted for Foreign Affairs Journalism for The Mail on Sunday 'Bonfire of the Ebola victims', 'Dying to Leave the Euro' and 'Voyage of the damned'. Shortlisted Investigation of the Year together with fellow alumni Lucy Osborne for Daily Mail 'Your Privacy for Sale'. Shortlisted for Investigation of the Year for BBC Newsnight and Buzzfeed News Kids Company investigation. Shortlisted for Investigation of the Year with fellow alumni David Pegg for The Guardian 'The HSBC Files'. Shortlisted for New Journalist of the Year for The Mail on Sunday 'Oxfam targets donors aged 98' 'Revealed: New boss of investigation into VIP child abuse claims is linked to Leon Brittan' and 'Jihadi hunters…or fantasists?'. Shortlisted for Politic Journalism for The Guardian 'The Clegg catastrophe', 'The undoing of Ed Miliband' and 'Britain on the brink'. Shortlisted for Popular Journalism for The Sun 'Their royal heillnesses: Secret 1933 film shows Edward VIII teaching this Nazi salute to the Queen'. Winner of 2015 David Nyhan Prize for Political Journalism for his work as a columnist for The Guardian. Winner of New Journalist of the Year for her work as the Editor of the Estates Gazette. Photograph of Gary Younge (above right) taken by Kristyn Ulanday.